Pavers are precast stones made of concrete that are often used in projects such as patios, walkways and driveways. The pavers come in a variety of sizes, shapes and colors, and can be laid in patterns that create an image or attractive design. Preparing the base before installing pavers is essential, especially on steeper driveways. According to Masonry Magazine, special measures are needed for a base in a driveway that is sloped more than seven percent. Mark the area where the driveway is being installed by driving wooden stakes into the ground, or by spraying the perimeter with spray paint. Dig a trench inside the marked area with a 1 1/2-ton excavator, going about six inches over the perimeter on each side. Follow local building codes regarding the depth of the trench, but generally you want to dig deep enough for a gravel base six to eight inches deep, a one-inch layer of sand, and the height of the pavers. In this example, we use six inches of gravel, one inch of sand, and three-inch high pavers, for a total depth of 10 inches. Smooth the soil in the bottom of the trench, and run over it with a compacter. Cover the bottom and sides of the trench with landscaping fabric. This helps stabilize the soil while preventing weeds from growing through gaps in the pavers. Construct a wooden form for the concrete header beam that is 10 inches tall, six inches wide and spans the length of the driveway. Place the form at the bottom of the driveway about a half-inch from the curb cutout. Fill the form with concrete, placing a #4 rebar into the concrete about two inches from the bottom of the form. Allow the concrete to set for the time specified on the instructions, then remove the form. Fill the trench with a layer of gravel three inches deep. Spray the gravel with water to reduce dust, and tamp it down. Add the second layer of gravel, spray it with water and tamp it down. Cover the gravel with a one-inch layer of sand. Smooth the surface of the sand with a two- by four-inch board, and check the slope with a level to maintain its consistency. Install edge restraints along the sides of the trench. Generally, place them against the sides of the trench, and drive metal stakes through them, into the ground; read the manufacturer instructions to be sure about the specific installation procedure. Set the pavers into position on top of the sand. Start at the bottom of the driveway against the concrete header. Lay the pavers in a herringbone pattern. Lay the first paver vertically, the second one horizontally, continually alternating. This helps to strengthen the driveway, and reduces the chance of the pavers becoming dislodged. If necessary, cut the pavers to fit with a wet saw. Run a mechanical compactor over the surface of the pavers to set them into the sand. Toss fine-grained sand on top of the pavers and sweep it into the gaps between the pavers with a broom. Sweep all debris, such as stones or leaves, off the driveway. Seal the pavers with a sand binding sealant, following the instructions on the package. Determine the amount of pavers that you need by multiplying the length and width of the driveway, then add 10 percent to the total to give you extra pavers if any are damaged or require cutting. 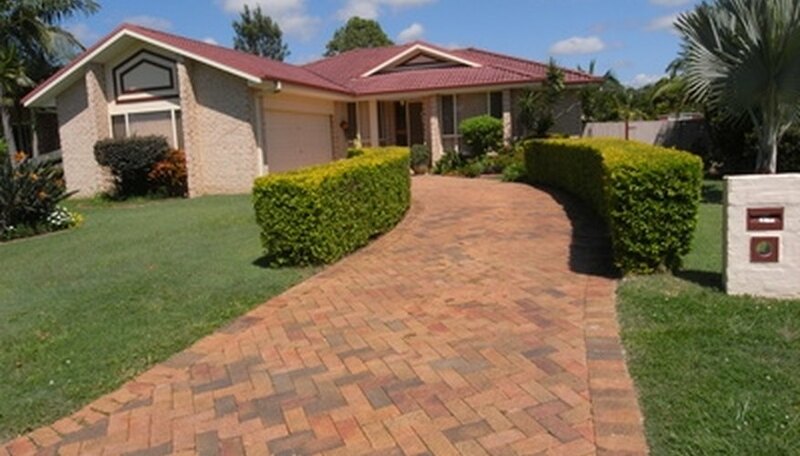 If your driveway is curved, you can order curved pavers from your supplier. Your supplier can help you determine how many curved pavers your driveway requires. Call 811 before you dig to get your utility lines marked. You can be held responsible and fined if you damage a utility line. Contact your local zoning board before beginning the project to acquire any needed permits, and to learn your local building codes. Wear safety goggles when using the wet saw.